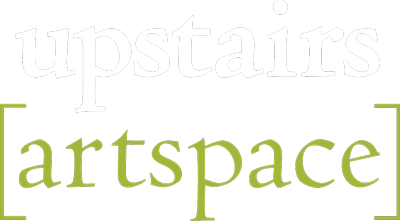 The Upstairs Artspace announces three new exhibits opening Saturday, October 20. An informal Walk & Talk with the artists at 5 p.m. is followed by a reception, 6 - 7:30 pm, with refreshments, cash bar, and live music. In the Street Level Gallery, Peter Roux takes pictorial painting to a new level with his cloud paintings – no horizon, just glorious, cumulus clouds. He has exhibited in the Northeast and Europe, but is gaining traction in WNC since moving to Hendersonville. In the Small Works Gallery, the intricate glass work of artist Michael Hatch will be featured. The Weaverville artist is known for colorful glass pieces ranging from sculptural to utilitarian, funky to beautiful. In the Downstairs Gallery, “SOLO CONNECTIONS” will feature the work of three local, emerging, female artists; Libby Skamfer, Nancy Lettenstrom, and Vivian Torrence. Libby started painting just two years ago, though in the past, she pursued other arts like jewelry making. Cold wax & oil is a painting technique that allows her to express heart and soul through the emotional language of color, shapes and textures. “My pieces evolve from my intuitive spiritual side and they flow naturally from my creative center”. Vivian Torrence’s collage work has a nostalgic feel with many references to history and mythology while addressing the affect that nature has on our life. 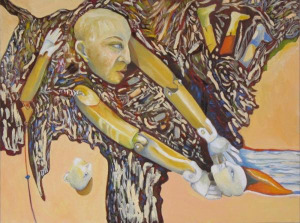 Nancy Lettenstrom’s work allows her to dwell on something having to do with life. “I try pushing it into a visual form. Doing the work is a way of acknowledging what is essentially “mystery”; it affords me some sense of involvement and even joy in the mystery of existence, despite my knowing that finding answers is unlikely”.